All the Halloween candy is flowing, just a quick reminder to take care of your little one’s teeth! Many parents feel that dental caries in baby teeth aren’t a big concern since they are going to fall out. Unfortunately this isn’t true, and proper dental care is important for all teeth big or small. According to the AAP, dental decay in baby teeth has a direct impact on the adult teeth below them and can lead to future dental problems. The CDC reports that about 1 in 5 children from 5-11 years old have at least one untreated cavity. Baby bottle tooth decay is common in children who drink milk prior to bed and do not brush, or are given milk in bed. This allows sugars from the milk to sit on the child’s teeth overnight causing decay; it can also increase risk of choking and ear infections. Tooth decay is caused by acid-producing bacteria. Parents and caregivers can pass this bacteria to their babies through their saliva via sharing spoons, cups, or testing food before feeding. It is important for providers to take good care of their teeth as well to prevent this transmission of bacteria. It is also important to instill good habits early in life and build a routine for children. The AAP recommends from birth-12 months, keep your child’s mouth clean using a wet washcloth. If teeth are present you can start with a soft baby brush and grain-sized amount of children’s fluoride toothpaste. 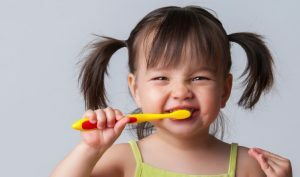 Children 12 months and up should clean their teeth 2 times per day for 2 minutes. Try to limit the amounts of sweets, sticky foods and juice your child eats and drinks. Most importantly, make brushing fun! Let your child pick his own toothbrush and toothpaste flavor. Play their favorite song for two minutes to help them keep track, and reward them for good oral care.